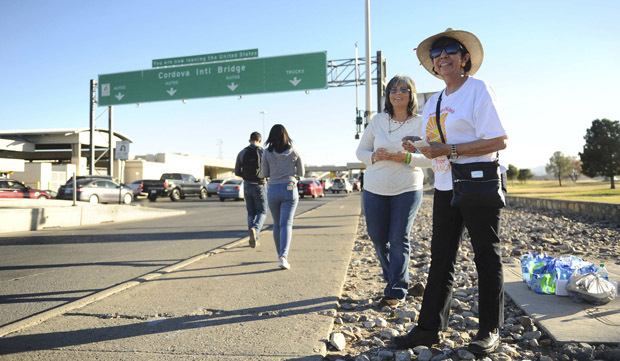 Hard data and people’s stories point to fewer Mexicans migrating to U.S.
EL PASO, Texas (CNS) — Mexican immigration rates have been down for a while, for a time even reversing. That reality seems to be absent from political circles and the perception of the general American population. But Diana Martinez is proof of it. She knew Pope Francis was coming to Ciudad Juarez, Mexico, but that seemed to have little value for her situation. Martinez was brief in telling CNS about the months it took her to make it across Mexico and into the U.S., and about the several times she has been deported. In the heat of another U.S. election year, immigration has been a theme for candidates, who have promised to fix the situation, but their words on the issue do not seem to reflect the reality being experienced by immigrants like Martinez. They are the face of a little-mentioned trend originally reported last November by Washington-based Pew Research Center. — One million Mexicans, including U.S.-born children, left the U.S. for Mexico, while an estimated 870,000 Mexicans came to the U.S.
— Sixty-one percent of Mexicans who left the U.S. did so voluntarily; 14 percent of those who left were deported. — Possible reasons for the decline in Mexican immigration include effects of the U.S. economic recession, resulting in immigrants losing jobs; and a desire to reunite families. — The number of Mexicans entering the U.S. illegally who were apprehended by authorities fell to 230,000 in 2014, “a level not seen since 1971,” says the report. — Among adults in Mexico, 48 percent say life is better in the U.S. Thirty-three percent say life in the U.S. and in Mexico is equivalent; that figure is 10 percent higher than it was in 2007. “This shift in immigration is noteworthy. Since 1965, Mexico has sent more immigrants (16.2 million) to the United States than any other country, in what has been the largest wave of immigration in U.S history,” concluded the report.